Then as all successful businesses grow, clients begin to multiply, projects pile up, and what once was simple becomes the jarring reality of becoming a freelancer or entrepreneur. I stumbled across Hello Bonsai in January of 2017 and have since handled all of my clients, contracts, and invoicing there. Here's 5 reasons Hello Bonsai should become your go-to application for all of your freelancing needs. We're in the digital age and the truth of the matter is, companies need to stay a step ahead, let alone keep up with the drastic changes of its' consumers. Hello Bonsai does just that. Say so long to the days of ballpoint pens to paper and payments in the form of hand-written checks. No printer, no problem! Do everything from your electronic devices in the comfort of your home. Get started and keep track of just about everything. Hello Bonsai makes all of the complicated stuff as easy cake. 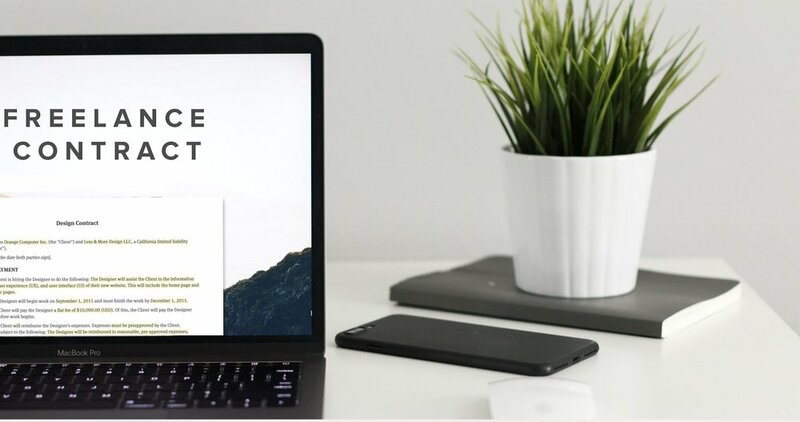 Start every project off on a positive and professional note with proposals by filling in a template, creating a price proposal, attaching all other necessary components, and clicking send. If and when a client accepts your proposal, a project will be created and you'll be able to start working! Project pages are your client profiles to track invoices, hours, and all other associated activities. Contracts are important; many freelancers overlook them. 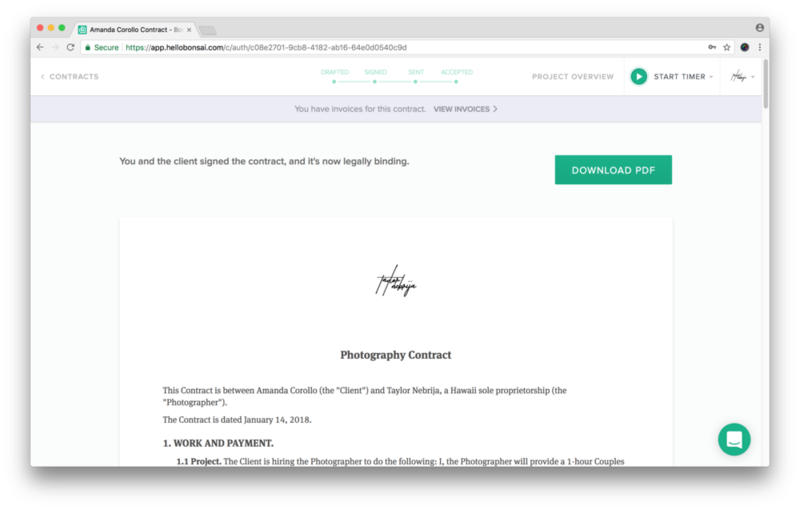 Rather than searching high and low for a contract that works perfect for you, use Hello Bonsai's template. Fill in a few empty slots, add a letterhead, electronically sign it, and send it on its way – a now legally-binding contract. And it's as simple (if not simpler) for your client to sign and return as it was for you to set up. Whether you're sending a one-time invoice or splitting them up into occurring payments; the platform is capable of it all. Before I found Hello Bonsai, I was jotting scheduled invoices down in my desktop planner and often times missed the send dates. You'll be able to customize auto-occurring invoices that'll send to your clients based on your contract. For freelancers working on hourly contracts – track and assign your hours to specific projects then Bonsai will generate an invoice to send to your client. You set due dates. Worry less about clients who miss payments. Hello Bonsai auto-sends reminders to prevent late payments and applies a compounding late fees (at your chosen rate) to those that aren't paid by the due date. Most invoicing apps accept credit cards; often times, only credit cards. Don't push your clients in one direction. Hello Bonsai has integrated payments for bank and wire transfers, PayPal, Coinbase and credit cards. All of which are processed and deposited quickly. If you're an entrepreneur or freelancer and aren't overloaded with work, tax season will be sure to add some pressure to your pallet. The start of 2018 also means getting everything prepped to file your 2017 taxes. I started using Hello Bonsai just at the start of my business, and I can already see how much the platform has simplified things. Track profits and losses and safely store electronic forms like your handy dandy W-9 to pull through tax season without a worry. Hello Bonsai recently introduced an accounting feature (in beta), so there's lots more to come! It's so darn simple. Stress less.